George Lafarge (left); Ben Becnel Jr. and Ben Becnel Sr. (right). The Creole Tomato Festival returns June 11 for its 30th year at New Orleans’ historic French Market. The event stretches over two days with live music, food booths, chef demonstrations, kids activities and artists’ booths from Dutch Alley to Crescent Park. Though the fest now includes a gala dinner and Bloody Mary competition, it still functions as it always has — as a means to honor and highlight local tomatoes and the farmers who grow them. The festival is really one of the main reasons that the centuries-long bond between the French Market and local farmers still exists today. 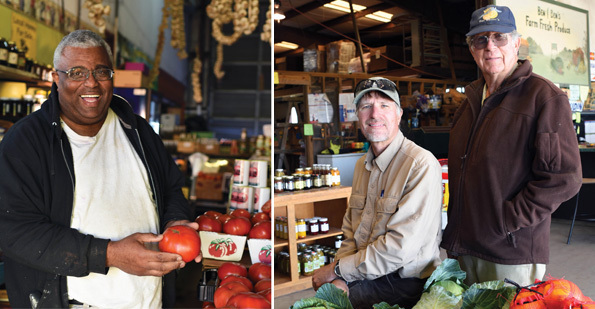 When June rolls around, two longtime Creole Tomato Festival vendors will be back at the market selling their tomatoes. They’re the unsung heroes of the festival, both with deep ties to the French Market and stories that reveal their heritage is as vibrant and juicy as the tomatoes they grow. One is George Lafargue Jr. of George’s Produce. Though his family business dates back to the French Market, today his stand is based in Terrytown, where Lafargue is so busy from January to June that he has a barber come out to trim his hair. At 9 a.m. on a spring day, his phone is ringing off the hook and his wife, Chanel, is loading a produce truck for an Uptown restaurant delivery before its lunch rush starts. But Lafargue remains calm. He sets up umbrellas in front of his produce stand to shade the citrus and mango from the bright spring day. “This is all for my daddy,” he says, looking at the first boxes of his Creole tomatoes, plump on a shelf just beyond the garage door entrance. Lafargue is a second-generation farmer. His father, George Sr., ran a large produce stall in the French Market for decades, and was one of the first tomato vendors at the Creole Tomato Festival. It still is hot, but locals often overlook that factor when it comes to getting their hands on those ripe tomatoes grown in Louisiana soil along the river parishes, perfect for sandwiches or on their own. You’ll find Lafargue in the shade at the festival, warning his customers not to make the amateur mistake of putting their Creole tomatoes in a refrigerator. When Lafargue was young, he ate only the vegetables his family grew on their plot of farmland in the Lower Ninth Ward. He ate corn raw from the ground. He didn’t know that other people ate produce that wasn’t grown in their own backyards. He first got into the family business by hopping on the back of his father’s produce truck — similar to the one Mr. Okra operates today — back when there were a lot more of them on the streets. George Jr. was big for a kid, and his job was to make sure neighborhood punks didn’t run up and steal any fruits and vegetables. “Meanwhile I’d be back there taking my bite of the plums and peaches,” Lafargue says and grins. It’s the same grin you’ll find in photos of him around the produce stand — his wedding day, his portrait snapped with George, Sr. for an old newspaper article, his inauguration as the first African-American King of Endymion in 2012, when his name was selected at random from the super krewe’s lottery. Turns out he’s a pretty lucky guy. Of eleven kids, he’s the only one who took up a spot at his father’s French Market stall, where he basked in the conversations of the vendors and observed his father’s craft. There was only time to watch and learn, and Lafargue did just that, right down to the beautiful braids of garlic that his father taught him how to string together. Today they dangle from the rafter of the produce stand. It’s a colorful affair located next to an abandoned carwash. The ripe, colorful produce practically spills out the door, as does the hospitality. A longtime customer moseys in, an older guy with a golfer’s cap, who’s in need of a mango. “That’s right,” says that man, holding his mango. Beyond them, soaking up the sun in the middle of the parking lot is George’s mother Dolores. She relaxes in her velour tracksuit, perched on a folding chair amidst a selection of her son’s potted, blooming fruit trees. The guest auctioneer that year happened to be Gov. Edwin Edwards, and a heated bid for 20 pounds of tomatoes boiled down to restaurateurs Paul Prudhomme and Al Copeland. “These are plums,” she tells a family friend, who has stopped to smell a blossom before heading inside to talk wholesale pricing on cabbages. “Plums,” she says and they both laugh. It’s unclear if that’s why she’s staked out at her son’s business today, but in any case, she shouldn’t have to worry. Lafargue has expanded his family’s business with five different farming properties. He works with over 25 farmers to supply the growing number of wholesale restaurant clients he has in New Orleans — a drastic shift from his father’s day, when restaurants would actually drive to the market and purchase produce from the stands. 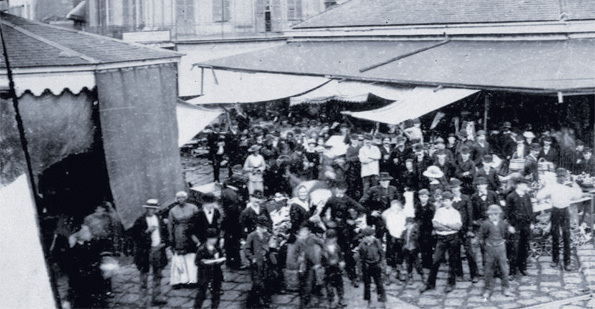 The French Market started to change direction from wholesale distribution in the 1970s, and Lafargue recalls an important turn of events for his family. Today, many restaurateurs have a personal connection with Mr. George, who prides himself of strong and lasting business relationships, much like his father. You’d be hard pressed to peruse the produce, honey and preserves at the stand without running into a chef looking for fresh-shucked peas and some good conversation. The same goes at the Creole Tomato Festival, where George’s Produce will likely sell out by the end of the weekend. Operated by Ben Becnel — a longtime tomato seller at the Creole Tomato Festival — along with his son Ben Jr., the eponymous Ben & Ben Becnel produce stand in Belle Chase is a decent distance away from Terrytown. 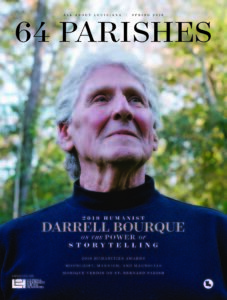 In the spring, stepping out his back door of his Plaquemines Parish home, Becnel says he’s in heaven. His citrus trees are snow white with flowers, filling the air with a jasmine scent. He spots his first hummingbird of the season alight on his trees. “Spring and fall are the best seasons to be a farmer,” he says, and he would know. Farming isn’t just a profession for Becnel. It’s in his blood. His grandfather on his mother’s side was an overseer at several properties including the Woodland Plantation, famous, in part, for its image on the Southern Comfort bottle. His paternal grandfather was a citrus farmer. “I got double trouble,” he says of his heritage and laughs. Becnel’s father, Arthur, sold mustard greens, beets and other produce at the French Market in the 1950s, and he’d often bring young Ben along on the truck. “The grocers would show up at 2 a.m. to get the best produce,” he says. Meanwhile, he’d try to stay warm on the floorboard of the truck, tucked under a blanket in the dark of early morning. By the late 1970s and early 1980s, Becnel and farmers like him were delivering produce to chain stores, including the A&P and Schwegmann’s, but today he uses a distribution company to transport his produce to grocers like Rouses. Becnel owns 80 acres and leases another 200 or so, where his famed Creole tomatoes are grown in spring, citrus in fall. He also grows myriad exceptional crops including strawberries, watermelons, peaches, crowder peas, cauliflower, and okra. That’s pretty remarkable, considering his grandfather didn’t own farmland at all and his father parceled off only seven acres to each of his ten children whenever they married. Unlike Lafargue, Becnel wasn’t the only child in the family to go into farming. He recalls a story about his brother, the farmer Johnny Becnel, who was the first to come up with a box of Creoles for the French Market’s tomato auction back in the 1990s. The guest auctioneer that year happened to be Governor Edwin Edwards, and a heated bid for 20 pounds of tomatoes boiled down to restaurateurs Paul Prudhomme and Al Copeland. The tomato auction basically allowed the first farmer to arrive with their Creoles at market to take home some extra cash. Eventually it evolved into a charity auction. But Becnel says the competition to see who has the first tomatoes of the season is never-ending, with or without an auction. At the Creole Tomato Festival, attendees can purchase seven pounds of Ben & Ben Becnel Creole tomatoes for about $15 or buy them individually for about a dollar a piece. Becnel also breaks out more produce for the occasion, including his best-selling okra. He’ll be set up in the heart of the French Market. Gwendolyn Knapp is the editor of Eater NOLA, and has worked as a freelance food writer for Zagat, The Guardian and elsewhere. She lives in New Orleans. 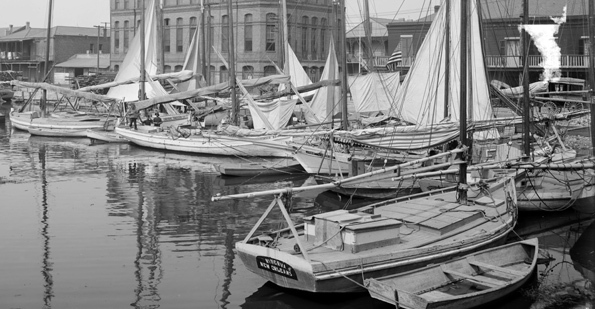 Distinctive sail boats once defined coastal Louisiana’s oyster trade.